Data from Pollack (Pollack, I. The information of elementary auditory displays. J. Acoust. Soc. Amer., 1952, 24, 745-749. / Pollack, I. The information of elementary auditory displays. II. J. Acoust. Soc. Amer., 1953, 25, 765-769.) on the amount of information that is transmitted by listeners who make absolute judgements of auditory pitch. 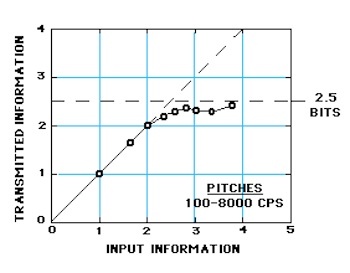 As the amount of input information is increased by increasing from 2 to 14 the number of different pitches to be judged, the amount of transmitted information approaches as its upper limit a channel capacity of about 2.5 bits per judgement. Models of the user have existed in HCI for a number of years. Some of the first where developed by Miller in an attempt to apply information theory to the human. Information theory is a branch of applied mathematics and electrical engineering involving the quantification of information. Historically, information theory was developed by Shannon to find fundamental limits on signal processing operations such as compressing data and on reliably storing and communicating data. Miller extended this model into the psychology domain by defining a model of the bandwidth that people could cope with, calling it a channel. This lead to the historic, and still quoted (often miss-quoted), 1955 work ‘The magical Number Seven, Plus or Minus Two – Some Limits on Our Capacity for Processing Information’. I must say that anyone reading Millers work will notice how well written and well argued it is, balancing scientific formality with an informal style to just the right measure. It is a delight to read. Of course I’ve a lot of time for Miller as he working with the same Psycho-Acoustic Laboratory at Harvard that, one of my all time favourites, J C R Licklider also worked at. But what does Miller really have to say, and why has the details of this message been lost in the intervening six decades? Miller’s paper is, in reality, a summary/analysis of other research findings couched in the form of bits per channel. In it, he amusingly1, relates the fact that the number seven seems to be plaguing his every move because within the analysis work he is currently performing, seven seems to appear repeatedly in regard to the amount of information that can be remembered or differentiated by humans. However there are two caveats to this assertion: firstly, that the user is required to make absolute judgements of uni-dimensional stimuli and secondly that that stimuli is not clustered. This last point is quite important because using clustering means that we can remember or distinguish more than the unitary seven. For instance, we can remember seven characters in sequence, seven words in order, or seven phrases. The way that these are chunked and the relative meanings of these chunks are important; which is why remembering a password generated by a computer, which often has no relative meaning beyond a sequence of absolute characters, is more difficult than a word from a dictionary which may have far more characters than the automatically generated password but is easier to remember because those characters have some kind of relationship to each other within the order. This means that when analysing multi-dimensional stimuli the assertion that seven is our bandwidth does not hold up. Indeed, Miller never stated it does in fact he is looking for an answer as to why we can remember and differentiate hundreds of faces, thousands of objects, and several thousand words. He asserts that the three most important reasons for this is that we make relative, rather than absolute, judgements, that we increase the dimensions along which the stimuli can differ, or that we make sequences of several absolute judgements in a row. The point seems to be that, as we add more variables to the display, we increase the total capacity, but we decrease the accuracy for any particular variable. In other words, we can make relatively crude judgements of several things simultaneously. We might argue that in the course of evolution those organisms were most successful that were responsive to the widest range of stimulus energies in their environment. In order to survive in a constantly fluctuating world, it was better to have a little information about a lot of things than to have a lot of information about a small segment of the environment. If a compromise was necessary, the one we seem to have made is clearly the more adaptive. This is ‘lucky’ for us in the HCI/Web Ergonomics domains, because at the interface level things are mostly multi-dimensional, mostly relative, and usually in chunks; for us, ‘Miller’ almost never directly applies. As with most things in the HCI world, the caveats and context, which are often left out, missed, or ignored are often the most important. So the well found psychological finding that working memory can handle seven (+/-2) arbitrarily sized chunks of absolute uni-dimensional stimuli, becomes the often quoted but mostly incorrect usability/HCI principle that you should only include seven items in a menu, or seven items in a list… and on and on. In retrospect then, it may not be the number seven that is so pesky, but rather our interpretation of it. It should be – it was initially delivered as an Invited Address to the Eastern Psychological Association in Philadelphia in April of 1955 and was only later republished as a paper by the American Psychological Association. Absolutely agree that we’d have benefited from hanvig a bit more of the traditional creative&visual design stuff in the course. I had to do my homework of catching up on creative design practice and processes largely on my own.However, the HCI at UCLIC is not (and is not trying to be) a purely design degree. The course website and outline makes it clear. There are obviously other design degrees in London, like the one you mentioned, or the interaction design at RCA. Lastly, I strongly believe that Task Analysis, Interfaces (this was mainly about design patterns), and Personas have their place in a design module within the framework of a HCI degree. Similarly, cognitive science, affective interaction, and ergonomics constitute the very fundamentals of what UX Design practice entails. You can’t effectively design for people without the knowledge of these. So I’d almost turn it on its head and say that it’s building on the these that makes our designs truly worth something.